The Kindergarten curriculum is based on age specific learning goals and has been designed keeping in view the educational trends and the needs of the children. A thematic approach is adopted to foster learning across the curriculum, placing an emphasis on developing key skills. It is planned across different areas of learning, facilitating the children to develop at their own space through differentiated and collaborative learning. It is child oriented, focusing on play and the individual personality. We firmly believe that the children need to be happy if they are to learn. Our curriculum provides opportunity for playing & exploring, active learning and thinking creatively. Enriched programmes to stimulate children’s’ interest are carefully planned and supported. 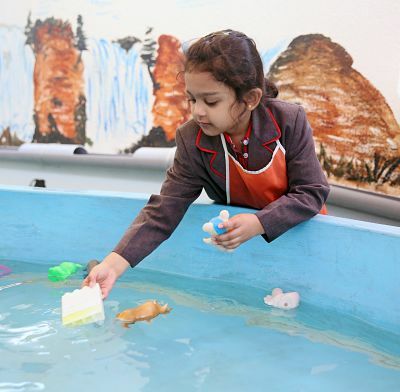 The children are exposed to a variety of exciting and positive experiences and hands-on activities which enables them to explore and enliven their interest. They are encouraged to think, find things and talk about them.